Last week, I talked about the topical or thematic use of the Japanese wa. This is where you will typically first start using the Japanese wa, but the magic of this little Japanese particle doesn’t stop there. There is another use for the particle that is a little bit more complicated. I’m talking about the contrastive Japanese wa. Although it is sometimes hard to tell which wa is being used in a particular sentence. 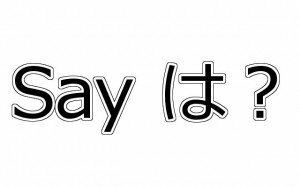 It is useful to know how to use it when you are using Japanese as well as to know that sometimes the sentence you are reading or listening to might have another meaning. Kono hon wa shashin wa kirei. Shikashi, setumei wa tumaranai. This book(‘s) pictures are pretty. But, the explanations are boring. Notice that the first wa is the topic marking wa and not a contrastive wa. This is usually the case. If there are several wa-s in a sentence, the first one is the topic marking wa and the other wa-s are contrastive. biiru wa nomanai. biiru wa kenkou jya nai shi takai. uisukii wa daisuki desu. demo, biiru wa daikirai. Telling the difference between topic marking wa and contrastive wa in spoken Japanese is a lot easier. You just have to listen for the stress. If stress is placed on the wa, then it is contrasting otherwise it is the topic marking. Try this out the next time you are speaking Japanese. Try to place emphasis on two different items. Watashi wa kesa natto wo tabenakatta. Watashi wa kesa wa natto wo tabenakatta. Watashi wa kesa natto wa tabenakatta. Notice that all three of these sentences have the same basic meaning (I didn’t eat natto this morning. ), but each has a slightly different nuance. (1) is just regular old vanilla sentence conveying the meaning of not eating natto this morning. (2) implies that I ate natto but not this morning or that I usually eat natto in the morning, but this morning for whatever reason I didn’t. (3) emphasizes the natto, which implies that you ate something this morning, just not natto. Where did the wo go? You may have noticed that the object marking particle wo disappeared. This usually happens when you want to convey the meaning of contrastive wa with an object. You can’t have wo and wa together, although you can have では、には、へは、からは、とは、 and よりは。 I’m not sure why this is. I’m guessing it was simply too difficult to say をは , so it isn’t used. That’s all I have for wa. I hope this makes some foggy points a little more clear. If you have any questions let me know in the comments below. Or if you have any tips about how to use wa, I’m sure others would love to hear it. P.S. Have you had enough learning about the wa particle? Me, too! Sign up for the newsletter! P.P.S. Can you not stop using wa in your sentences? Then try joining my Facebook Page for all the latest updates. Previous post: JLPT BC 65 | WTF is KY?